Here at Carriage Mitsubishi, we want to say thank you to our loyal customers by offering great monthly specials! Thanks to you, our dedicated Gainesville, GA Mitsubishi customers, we have grown terrifically and we are able to offer you some amazing deals. Each month we plan to bring you outstanding deals on brand-new Mitsubishi models! Below you will find great deals and quick links to browse our inventory. We update these specials every month, so be sure to come back and see what specials we will be offering next month on new Mitsubishi cars, trucks, and SUVs! Along with our fantastic monthly specials, Carriage Mitsubishi also offers competitive New Mitsubishi Specials as well as Used Inventory Specials! The Carriage Mitsubishi Parts Department carefully selects only Factory-Certified Parts. When you purchase parts from Carriage Mitsubishi, you can rest assured that you are getting the highest quality products selected for your vehicle by experts. If you are looking to accessorize your vehicle or are in need of replacement parts, we’ve got you covered! We always offer great Mitsubishi Parts Specials! Call today at 770-536-4434, or visit us at 2801 Browns Bridge Road Gainesville, GA 30504. And if you are looking to repair your car, truck or SUV, or you just need some routine maintenance, or maybe a service check-up, then don’t forget to check out our amazing Service Specials! 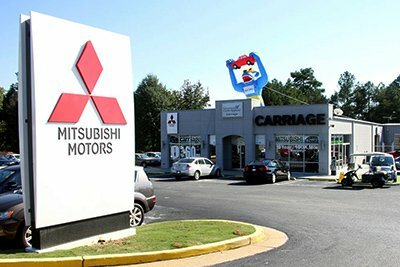 At Carriage Mitsubishi in Gainesville, GA, our service department is staffed with the most qualified, factory-trained technicians, working with the highest-quality equipment to keep your car running smoothly. Here at Carriage Mitsubishi, we remain focused on only one thing… Complete customer satisfaction! Call today at 770-536-4434, or visit us at 2801 Browns Bridge Rd. Gainesville, GA 30504.